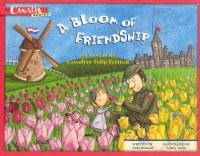 I love this book, as an adult who was looking for more history about the tulip festival. I wrote a book review at A Bloom of Friendship and would welcome your comments there. It is too bad that the hardcover book seems to be unavailable. This book makes a lovely souvenir of the festival but the paper edition is just not quite as nice!